Anyway, there's step #8, ordeal. It's all up from here. I've never been drug tested at work. Maybe they assumed that anyone with really interesting security clearances, and who were used to safety critical work where if you screw up, people may die, perhaps thousands of people, would be so risk averse as a matter of culture they'd be careful about any psychogenic materials, legal or not. I have been breathalysed a dozen times or more, because we have RBT - random breath testing. Police set up a checkpoint, and pull over vehicles at random. Personally, because I have an unusual metabolism, with non standard neurotransmitters, it's wise to play it safe. I have a strong allergy to the plant cannabis sativa, meaning dope smoke acts like tear gas on me, and I get sneezing fits if I enter a room where grass has been smoked in the last few days. I have a high tolerance for Pethidine (Demorol), Fentanyl appears to have no effect, Morphine hyper effect, BP and heart rate crashed with a 'test to see if safe' dose, Codeine phosphate normal. The things you learn when being taken to resusc in an intensive care ambulance. Apparently I have ridiculously large numbers of Kappa receptors, but little in the way of Mu or Delta ones. I guess the point I'm trying to make is that one should be prudent about the use of psychoactive chemicals. Humans vary in their responses. A dose that is safe for 99% of the population might be very unsafe for some of the other 1%. Best is to try microdoses first under medical supervision, or, if known to have anomalous responses like me , steer clear unless necessary. I'm just going to put it out there that I've never had a single encounter with Mary Jane. The entire first chunk of this strip tells its own, fascinating micro-plot which is this: Marten and Dora are very much over their break-up. Not exactly startling news, I suspect that it was at least a year ago in-comic time. However, it's good to see them so relaxed and able to communicate with each other without awkwardness. Heck, in panel 2, Dora even felt able to use a pet-name! I'm still trying to work out when the other shoe will drop with Claire, Tai and Claire's mother. I suspect that Marten and Dora will need to come and collect their respective girlfriends on the grounds that they are not fit to walk anywhere unaccompanied. They may also need Faye and Bubbles to help them push the wheelbarrows they'll need to carry the unwary stoners! I've got a feeling that Dora and Marten may find it a bit hard to handle a pair of 'snuggly' girls who doubtless want to them them what wonderful SOs they are! Doing stuff is harder when you have someone who absolutely will not release their hug attached to you! I'm still not sure why you're convinced that others are judging people for not partaking on this forum. I've seen no evidence of any such judging. Who said I was convinced? As you say, there's no evidence for it. I was just being a bit over-defensive. I suspected there might be someone out there. Likewise, and given my hippie-like attitude and appearance, people always assume that I DO partake. I've had it passed to me and immediately kept it moving. I feel no judgement here though... merely idle curiosity. Expecting to be judged for an insignificant fact is pretty judgemental. Do you think so? What makes you say that? If I told you that I was more worried it would appear insecure, would you think *that* was judgement? Mostly a sense of humorous symmetry. Though I would argue that expecting people to judge you for something insignificant is at least adjacent to assuming that they are the kind of people who would judge you for something insignificant. Can't expect someone to do something jerkish without assuming they're at least a little jerkish. Honestly, I didn't mean anything too terribly deep by it. I'm probably just feeling introspective. Also, you did ask us to judge away. Anyway, let's get back to the comic. Random observation: that is rather long hair, and a quite dapper hat, in panel one. I'm still kind of hoping she'll be fine for the exam. The style of those two background characters is subtly different; I'm hoping that Jeph is going to confirm that they are either a friend's OCs, based on friends or based on women he saw at a convention at some point. Actually I can answer this one. 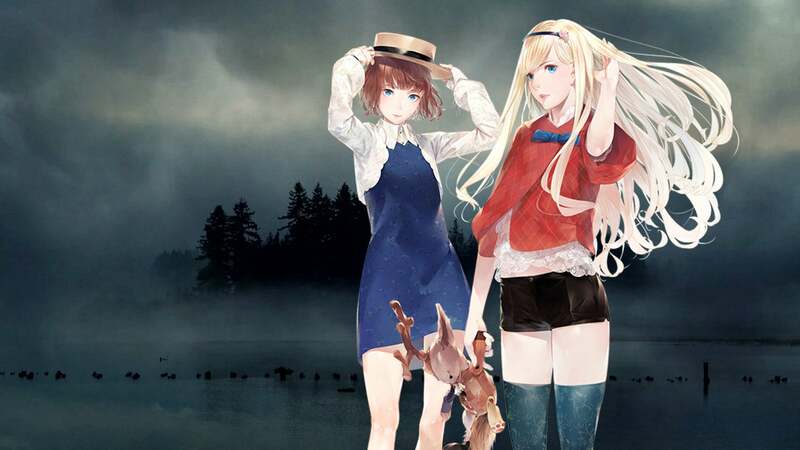 The characters in the background are JJ and Emily from "The Missing: J.J. Macfield and the island of memories" a game by Swery. The guy behind Deadly Premonition and D4. https://assets1.ignimgs.com/2018/10/18/themissing-thumb-1539835241345_1280w.jpg for a picture of JJ and Emily. O God indeed! I can understand it, though. If you produce a comic strip and you've seen that sick elephant line as many times as Wondermark readers have, maybe the impulse to regurgitate it is irresistible. Here specifically as in this forum? Because that's surprising to me (and yes, me, from earlier in the thread) and possibly something the mods would need to chat about. I wouldn't say it was exalted or glorified, but rather its more socially acceptable to talk about, even compared to a few years ago. Bear in mind that the comic author lives in a place where cannabis use is legal, and it is legal in various states of the US, also in at least one European country represented here. Any international forum is going to meet issues over which different members will have differing views and be subject to different laws. This forum prefers to allow the union of the possibilities to be discussed, rather than restricting discussion to the intersection of the possibilities (or worse, tying it to one jurisdiction) which would amount to censorship. Of course, this also requires the users of the forum to be aware of this, and to be prepared to learn about and tolerate local differences without inappropriate judgement. The option to step away from a particular discussion is always there, and doing that is not a reason for anyone to be judged in turn. Thank you, PWHodges. Ever the voice of reason. I'd also like to point out that everything I've mentioned in here is based on a combination of knowledge gained through curiosity over many years, and rather heavy use in my now-distant youth. It's been about 30 years since I've had a toke, and for good reasons. Words of wisdom from the Science Fairy. "The number you have reached is an imaginary number. Please hang up, rotate your phone 90 degrees clockwise, and try again." "If you go the other way you'll get negative results." "And why exactly 90 degrees?" "Well... otherwise things get complex." Let's keep it Real, OK? I spent much of my twenties in a sincere, committed relationship with Ms Jane. ED IS THE TRUE PATH TO NIRVANA! ED HAS BEEN THE CHOICE OF EDUCATED AND IGNORANT ALIKE FOR CENTURIES! ED WILL NOT CORRUPT YOUR PRECIOUS BODILY FLUIDS!! ED IS THE STANDARD TEXT EDITOR! ED MAKES THE SUN SHINE AND THE BIRDS SING AND THE GRASS GREEN!! Editor wars... Don't make eye-contact, and just keep walking. Oh, I know. I used to use ed (and later, the improved version, ex). An unadorned "?" was ed's standard (and only) error message, hence my "comment". The Unix philosophy: "If you don't know what mistake you made, you shouldn't be using ed. Oh heck, you probably shouldn't even be using Unix." One last comment on the drug testing debate: CDL drivers are actually mandated to have drug tests done annually. I've had my CDL since July/August 2017 and only been tested twice: onc as part of the DoT physical exam preparatory to getting my license, and once within a couple of hours after I ran the bus off the road into a ditch (not why I don't drive the bus now BTW.) Drivers for the company I worked for are subject to random testing, but my number never came up. Yeah, have an accident with a CDL and expect to pee in a cup very shortly thereafter. If you're in one piece and survive, that is. I'm certainly approaching the point where my impulse to regurgitate when I read that line is irresistible. I kept expecting that it would eventually circle around to being funny again after enough repetition, but (at least as far as I'm concerned) it still feels like it's been going approximately 14 billion years too long. I liked Wondermark, dammit! Cannabis storylines in various media are always a mixed bag for me, as I was relatively close to one who was that 1%. Full-blown psychosis, in and out of institutions -- the whole nine yards. It isn't ever going away. What makes it insidious to me is that his brother was totally fine after spending a few years as a full-time stoner, part-time bowling alley receptionist until his band took off. It's so difficult to judge ahead of time -- your brother's been smoking for years, surely you won't react badly? Yet, how else were we going to see Mayor Cookiemoose? The real question is whether he's a chocolate moose. And even "if you make mistakes, learn to live with the consequences. We don't ask for confirmation and we don't do undo"
It's Thanksgiving. Why don't we discuss all this over some nice pi? No, ala mode. You know, the highest frequency, Kenneth. Does the doodle of a cat with a halo mean anything? I'm taking that as Jeph's little homage to our household's recent little tragedy. I have been lurking around here for years, but realised that I had postponed making a user several times for fear of the "this guy made an account for this"-effect. I finally stopped caring. He could be any flavour of moose, really. Especially given the situation. Perhaps his flavoral properties are more closely explored this week? Cookiemoose? You made an account to post about COOKIEMOOSE? I am really enjoying this arc! From the beginning I knew that the mix of characters would make a fun story. Tai is a super experienced stoner and mostly functional recreational drug user. I like that she has consistently been the voice of reason and experience, and now is the one calling in "an adult" when the situation needs it. Whatever your opinions on cannabis use, this comic has been a pretty good example of responsible drug use and safe trip practices. I appreciate that a lot! Never mind drugs, what about that blonde in 3875? Will we see more of her in future? Would have tweeted this but Twitter reckons Jeph's blocked me, which is strange as I'm fairly certain I've never had any interaction with him before and certainly can't imagine why I'd be blocked! Ah well. I doubt it; she and her friend with the hat are another artist's OCs, so he'd need their permission to use them. There's some Twitter blocklists going around, and some of them have inaccurate blocks. (I know of a popular anti-GamerGate list that a TERF got control of and started blocking lots of trans people, for instance.) Could be that Jeph is using such a list.